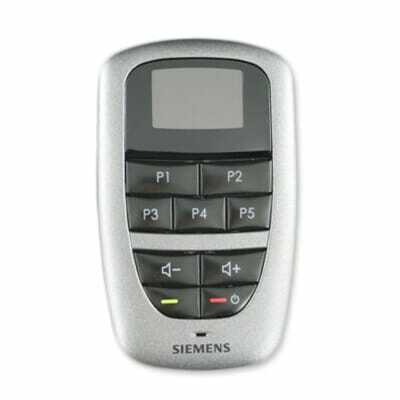 You can go wireless with Siemens Tek remote, connecting your hearing aids to all of your wireless devices. Get your mobile phone connection directly to your hearing aids from a button on the Tek as well as being able to link directly to your television. Sound can stream directly to your hearing aids from your audio systems and MP3 player. Listen to it all with new clarity and enjoy a rich, clean, high quality listening experience. Using the new Tek remote with compatible Siemens Pure, Pure Carat, Motion, Aquaris and Life open ear hearing aids. The Tek no longer requires you to have it on a chord around your neck for usage. It comes with a transmitter that can be attached to a TV or other audio generating devise. BlueTooth: Most cell phones are easy to pair with the Tek. Once paired, when the phone rings you will hear a tone in your hearing aids. You then have a choice to accept or reject the call by pressing a button on the Tek. To accept a phone call, press the green button on the Tek. If you are wearing a pair of hearing aids, you will hear the call through both aids. Sound is clear and may be turned up or down and adjusted for tone. Note: This is probably the best phone audio quality most hearing impaired folks will have experienced since their hearing loss began. During the phone call you talk into the Tek holding it about 12 inches from your lips. Your voice will be very audible to the person on the other end, even though some low background noise may be transmitted along with your voice. To end the call simply press the red button. Audio Using the Transmitter: A small transmitter is included with the Tek. It has a rechargeable battery and a power cord so you can leave it connected to the TV for long periods of time. On the transmitter you can adjust volume level thereby setting the volume of the transmitted signal either louder or softer than the sound in the room. This means you can have the TV louder in your ears than it is to the people listening to it normally, a nice feature. Overall: The Tek offers technology that allow hearing impaired people to hear phone conversations and TV much better than anything else on the market. The buttons are easily seen, understood, and used. There is a tone control on the Tek that is a great help in sharpening hard to understand voices, or adding more bass for richer music. You need to be somewhat tech savvy to pair a BlueTooth phone with the Tek. The Tek is about the size of a cell phone, so you have to be willing to carry it. The Tek Remote cannot be returned for refund.